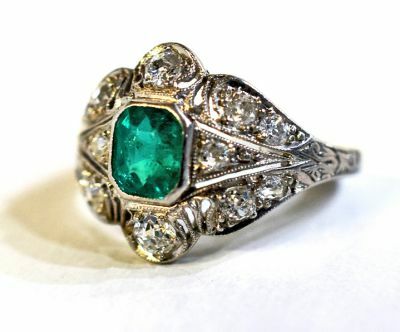 A beautiful Art Deco platinum engraved and mill grain ring featuring 1 emerald cut medium intense green emerald, est. 0.78ct and 12 old European cut diamonds, est. 0.34ct (SI clarity & G-H colour). It is currently size 3.